Bet9ja offers a stunning mobile app for Android users. The app not only allows access to an ever-increasing selection of sports but caters to gaming enthusiasts via a live casino, online casino and virtual game casino. While many apps are found directly through the Google Play store, the Bet9ja app is only available by downloading the .apk file directly from the site. To help you download and install the Bet9ja Android app, we included a step-by-step guide for added convenience. Open the official Bet9ja website using your mobile browser and select “Mobile” from the homepage menu located at the top of the site. Then select either “Download Casino” or “Download Sportbook”. This will download a .apk file that is approximately 4.7mb in size. In the event a security message is triggered, click on “Settings”, select “Unknown Devices”, then authorise the “unknown source”. This will begin the .apk file download and subsequent installation. Once completed, open the app, register a new account or proceed to log in with your current account details. Although Bet9ja comes with a rather innovative mobile app for Android users, the same cannot be said for those that are looking for an iOS mobile app from Bet9ja. To date, Bet9ja has yet to develop a dedicated mobile app for iOS users instead opting to create a dedicated mobile browser version of the site. This provides equalled access and quality to that of its desktop version and therefore saves you from downloading and installation of an additional app. iOS users need only to open a mobile web browser and visit the Bet9ja website in order to create an account or log in with pre-existing details. The Bet9ja mobile version comes equipped with a respectable selection of features to ensure your online betting experience is of the utmost quality. The site utilises the same black, grey, and green colour scheme as its desktop counterpart and offers a calculated mobile website layout to make navigation as effortless as possible. Several categories are located at the top of the mobile version to help you navigate through the variety of betting options such as the live casino, sports betting, the casino, Rewards and various other areas of interest. Situated underneath the various categories are current promotions and sporting events deemed most popular for the day or week. All available sporting events for the day are located below the promotions and popular sporting events, each neatly categorised by the sport in question. One nice aspect to the mobile is how quickly and efficiently it loads. With its well-executed presentation, sports betting veterans and newcomers alike can easily locate areas of interest without any difficulty. 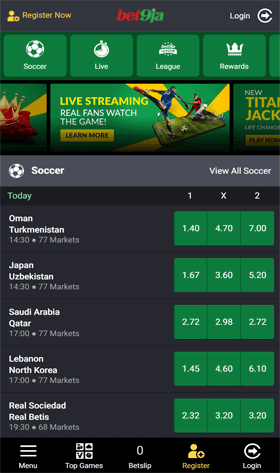 As previously mentioned, Bet9ja comes equipped with a host of features, both for the mobile version of the website and for the Android application. To give you a better understanding of what is in store when using the mobile platforms provided from Bet9ja, we have chosen to list those thoughts most useful, and with each, a brief description to help you make a more informed decision before deciding if Bet9ja is best suitable to your needs. The Cash out option is one of solid value, especially for those times when there is doubt that your chosen team may not return a favourable result. This option is designed to put you in control over your active bets by giving you the chance to cut your losses if you believe your team is not going to win. The cash-out option at Bet9ja is available on pre-game and live matches, and if chosen, will see a portion of the staked bet returned to you. On the other side, you can cash out your bet with a profit. Bet9ja also has in place a remarkable in-play betting platform that allows for a wide range of bets on in-play sports events. This is ideal for those actively watching a game or match, especially given that odds are updated in real time. In addition, there are updated statistics and other features designed to improve your odds through the compilation of relevant information. For real-time streaming of sports events, the Bet9ja mobile platform has been designed to multiple streaming options on a variety different sporting events. While almost a standard in the world of sportsbooks, it is an option that, when presented well, is a valuable asset. When used with its innovative features and updated odds, it allows you the perfect opportunity to not only view live streamed events in full HD but truly immersive yourself in the betting experience you receive. Sports betting, while not the only focus at Bet9ja, is a large part of its attraction for many punters. As with most sportsbooks, Bet9ja provides an extensive list of sports one can place wagers on, but it extends beyond the ordinary to include multiple verticals such as Snooker, Politics, MMA, Darts, Bandy and Antepost Soccer to name a few. Betting options also offer flexibility due to the different bets that can be placed, and with a strong focused towards soccer, Bet9ja more than meets the needs of the Premier League to England’s EFL Cup. Bet9ja also comes equipped with an online casino. However, the chosen software supplier for this falls somewhat short on expectation in respect to quality and selection. Included within its casino is a selection of video slots, table games, TV games, arcade games, roulette and numbers. While it may be less than what most are accustomed to seeing, for those who look for games less common, it is the perfect solution. The live casino is an exception to that mentioned above and is powered by leading industry expert Evolution Gaming. The quality and selection rivals any other live dealer casino and with games such as Live American Roulette, Live Baccarat, Live Roulette, Live Blackjack, Keno, Texas Hold’em, and Live Lottery, finding the perfect game of choice is not a challenge. Another fine aspect to the live casino is its choice of beautiful dealers that allows casino enthusiasts to enjoy a constant stream of exciting high-definition games from private gaming studios throughout the world. Bet9ja Play is the sites answer to virtual sports betting, and within, you find virtual sports such as Horse Racing, Dog Racing, La Liga, and Premier League. One of its strongest features is the available odds and statistics that are offered prior to each virtual race. This helps to increase winning odds, and with a constant stream of events, the opportunities are rather attractive. Bet9ja mobile site is compatible with most devices, and most will not have difficulty accessing the site or any of its betting markets. As it common with any mobile device, quality depends on the speed of your internet connection as well as having an updated operating system downloaded. Generally, most devices will alert users to updates, and if this is the case and you have yet to download the latest updates, you may wish to consider doing so prior to registering your account to avoid possible lagging or quality issues. As a measure of helpfulness, we have included a list of those devices known to be compatible with the Bet9ja mobile portals. Bet9ja does not provide bonuses specifically for mobile, but instead any bonuses, including welcome offers, on-going promotions or those released for a specific event or date on the calendar are offered across all platforms. Those registering new accounts will be welcomed with a new players bonus. To complement this, a rewards program is in place as there are other promotions for existing players. Bet9ja offers multiple methods to accommodate deposits and withdrawals. These are available irrespective of the method used to access the site. Those in place are reliable trusted, and safe depositing methods that allow for quick processing of transactions. The only downside to the methods offered is those for withdrawals are substantially less than those for deposits and currently only allow for bank wire withdrawal payments. Below is a full list of deposit methods, minimum and maximum deposit limits as well as payment processing times. Is Bet9ja available to customers worldwide? Unfortunately not at the moment. The full Bet9ja website with the betting options can only be accessed by registered punters and online casino players that are currently residing in Nigeria. What currencies are available to punters on the Bet9ja online bookmaker? Due to the fact that the site can only be accessed by punters in Nigeria, the site only offers one currency at the moment, including Naira. What contact channels are available on the Bet9ja website? Should you ever have a query, or you are experiencing a problem with your account, you can get in touch with the Bet9ja support team through several mediums. This includes sending them a quick email, giving them a call, or getting in touch with them through Twitter. The telephone support centre is available from 09:00 am until 21:00 pm daily. Is the Bet9ja website safe and secure for mobile use? Of course. The Bet9ja mobile portals utilise the same SSL encryption technology as the desktop version which means your personal and financial data is kept safe at all times to ensure third-party hackers won’t obtain your details. Is the Bet9ja mobile portals fair, trustworthy, and reliable? Yes. Due to the fact that Bet9ja is licensed and regulated, punters don’t have to worry about the odds being unfair or even the casino games being rigged. The site also undergoes independent testing on a regular basis to ensure all the games are fair. Why can’t I enjoy live streaming on the Android app offered from Bet9ja? The Bet9ja Android app does not currently offer live streaming services to its users. We contacted the support team to find out when this will be available, but they were unable to provide an answer to when this feature will be available. Does Bet9ja offer any tutorials on the site? Yes. You will find a plethora of useful tutorials on the site, covering a vast selection of aspects on the site, including how to register, how to claim a specific promotion, how to deposit, how to withdraw, and more. Bet9ja was established in September 2013 as an online bookmaker offering a wide range of betting opportunities on a variety of major sporting events. Situated in Nigeria, Bet9ja is currently trading under KC Gaming Networks Limited, a company run by several shareholders from multiple countries. The Bet9ja website is licensed and regulated by the Lagos State Lotteries and as such is permitted to provide its services and products to a residence in Nigeria. Bet9ja is the second most popular site in Nigeria after Google and is owned and operated by Kunie Soname who is also considered the site’s chairman. Bet9ja is also the official sponsor of the Nigerian National League since 2017. When it comes to the mobile version features, in-play betting platform, odds, betting markets, and sports to bet on, Bet9ja excels in every single department. The overall layout of the mobile version and Android app is incredible, providing a truly unforgettable online betting experience with smooth navigation and neatly presented features to make it more convenient for those on the move. However, Bet9ja has yet to develop a dedicated mobile app for iOS users, and the fact that it doesn’t offer a live streaming service on the Android app is a bit disappointing. The site also doesn’t cater to horse racing events around the world and only features a virtual racebook which is another downside to the site. We, therefore, believe that a 7 out of 10 is a decent rating for Bet9ja as there is still loads of improvements needed on the site.